Lawrence Moten, Donovan McNabb, John Wallace, Marvin Harrison, Otto the Orange. These are just a few of the guys that were a big part of my sporting life while following the Syracuse Orangemen an hour and a half away in my hometown of Rochester. It was my favorite team, up there with the Bills and Sabres and that passion continued as I went to school in Oswego and got to attend both football and basketball games at the Dome. The culmination was that magical night on April 7, 2003 when I screeched and ran around campus after Kirk Hinrich’s shot fell short and Jim Boeheim raised his hands up as the Orangemen won the National Championship. After making a career-move to New Jersey and following the incredible sharpshooting of G-Mac, Syracuse Athletics slowly started to evolve just like other Big-Time Athletics in the NCAA. Growing more towards the Kyle Whelliston school of thought, these were small things at first that were just annoying: Branding themselves as “New York’s College Team”, advertising in Yankee Stadium, following the college football fad of having matte helmets with crazy, funky designs and changing uniform colors. Then came the bombshell…A-C-C. Along with Pittsburgh, they were one of the first on the East Coast to make a major league switch and the conference change was for that almighty Benjamin in addition to more exposure (as if they didn’t have enough). With my frustration for the Power 5 conferences growing, along with my deepening love for smaller schools playing in geographically sensical leagues, the Syracuse Orange part of my life was fading. In 2012-2013, I was having a hard time enjoying their games and in basketball season, found myself openly rooting for Montana in the first round of the tournament. Last year, I stopped following ‘Cuse cold turkey and didn’t miss it. Not even my friends back home knew about my disloyal jumping of ship. Ending a favorite sports team relationship is so rare (and out of my character), but I just could not stomach being a fake fan of a team/school. All of the new directions from the program rub me the wrong way and yeah, I miss the good ol’ days, but continuing to follow and root for the Orange wouldn’t be honest to myself. All of this brings me to today, where I returned to the sight of so much sporting change in my life. 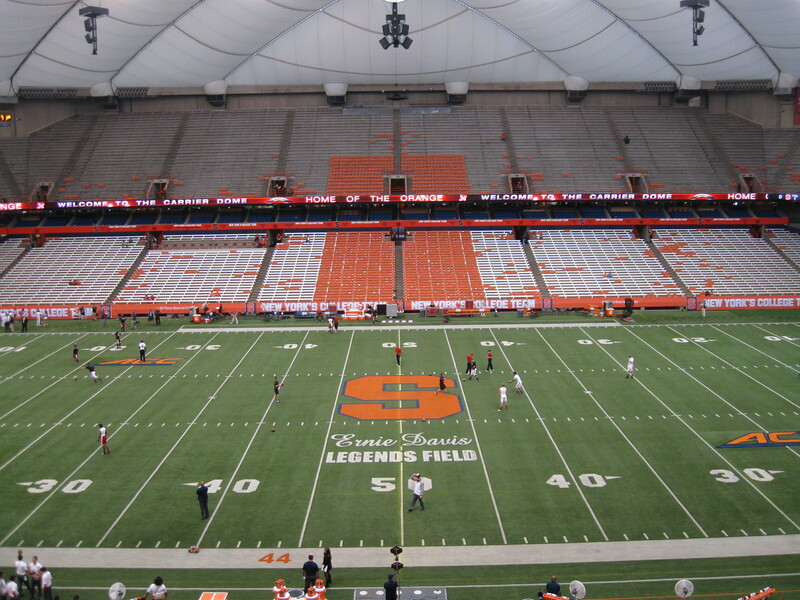 Being back amongst the Orange faithful did make me do some reconsidering as I got caught up in the pageantry of game-day, however my visit and review of Syracuse football comes from a purely neutral perspective. I will say though, it did give me great enjoyment to buy a $30 face value ticket (not including exorbitant TicketMaster fees) for just $8.25 on StubHub. Take That! My day in the Salt City began around Noon and I started downtown in the trendy Clinton Square section. Syracuse’s roads are surprisingly bad and misleading as twice I had to detour. The first was on my arrival as the garage I needed was on a road being repaired. Once parked, I ate at Kitty Hoynes and though I didn’t have the Reuben Fritters that Guy Fieri sampled…I did go with a Reuben, which was just meh. The pub did make for a good place to catch the Orioles-Tigers Game 2 playoff game. After wandering the area on a beautifully warm October day, I stopped at the free Erie Canal Museum. It was surprisingly enjoyable that improved by the exhibit, highlighted by the replica Line Boat and the displays inside. I still remember the song Low Bridge that I needed to learn in the 4th Grade. I also made a stop at Destiny USA, a shopping mall whose plans to become the biggest in the US were often delayed and cancelled when I was in college. Well they finally followed through with some plans, just not to the grand scale that was foreseen in the early 2000s. The third floor features an entertainment section with go-cart racing, bowling, restaurants, kid adventures and a Dave & Busters along with some other stuff. It was dead on a Friday afternoon, but it looks like I found a pit stop in several years for future kids on our way to see family. I made my way towards the Carrier Dome pretty early for picture purposes and that means taking a shuttle bus from the Skytop parking area. Given that it was a Friday, tailgating was limited and I was one of only a few people on the bus at 5 PM for a game starting at 7. If one is not familiar with the area, it can be a little confusing as the shuttle also acts as a regular college transportation system and the Dome is not visible from the drop-off point. Usually first-timers can just follow the crowd, but this was not the case just yet. I spent a little time around with the diverse campus and I always loved how the Dome is right in the middle of it. However, I can never get a decent exterior shot and the surrounding hillside exhausted my efforts to find a good shot. After passing through the revolving doors and feeling that suction of air, I made a couple passes around the generally dank concourses. There are pictures on the walls to help liven things up a bit and it wasn’t until the very end that I found a few display cases worth perusing. Food remarkably remains terrible with practically every stand selling the same worn options of Hoffman’s Sausage Subs or German Franks. The beer on the other hand is flowing with different options all over (keep in mind, this is a rare on-campus facility to offer beer). 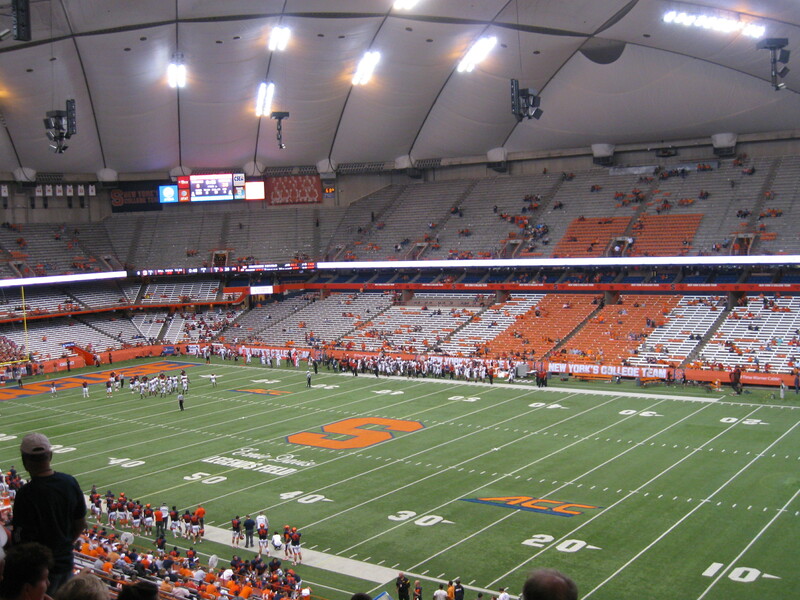 I still love the Carrier Dome as a football stadium with the seating being intimate and the design decent. While the bleachers may be uncomfortable, pretty much anywhere offers a fine sightline. They don’t call this place the Loud House for nothing and the enclosed Dome setting makes it roar. I’ve been to Wisconsin, Penn State and Notre Dame and when it comes noise, I think Syracuse is loudest with less than half of the fans. This ACC opener only featured a stadium about 3/5ths full, but it was still very noisy, especially as everyone got up on third downs. Just imagine if the program did get back to prominence. The game was a sloppy affair as both turnovers and penalties hurt the Orange. A bad play call gave Louisville a safety in the first half and then poor clock management by QB Terrel Hunt led to time running out at the end of the first half as Syracuse was one yard from the end zone. The second half was not much better as a wide-open Jarrod West dropped a gimme touchdown. Louisville added on more (including another safety) and they won 28-6 as the Dome was empty with a minute left in the game. It was a fun event as I met up with my college roommate and friends and we finished the night by tailgating after the game. Ah the good ol’ days.